Vinyl flooring looks great when first installed but eventually it can run its course. Dated, worn, or torn vinyl flooring cannot easily or effectively be repaired. Often, the best way to deal with this is to remove it and replace it with another floor covering. Some floor coverings can be installed with vinyl flooring underneath. As long as the vinyl is in good structural condition, it can accept laminate, wood, engineered wood, and often ceramic and porcelain tile directly on top without intervening underlayment. Many homeowners prefer to remove the vinyl flooring altogether and start clean. Liquid, chemical-based adhesive removers such as Klean-Strip can help with vinyl flooring removal, but they come with their own set of issues, too: smell, mess, and cost. Plus, they often don't work as well as promised. The dry, chemical-free method described here depends on elbow grease, coupled with patience and an understanding of how vinyl flooring is glued down in the first place. Prybar: A flat prybar, rather than a large wrecking bar, is essential for pulling off trim and baseboards. Five-In-One Tool: This tool has several functions, but you will mainly be using the sharp blade at the end for scraping the flooring away from the glue. Wood Block: This scrap of wood assists your prybar in taking down trim, both by providing extra leverage and by protecting your walls. Utility Knife: Any type of solid utility knife with locking, interchangeable blades will work fine. 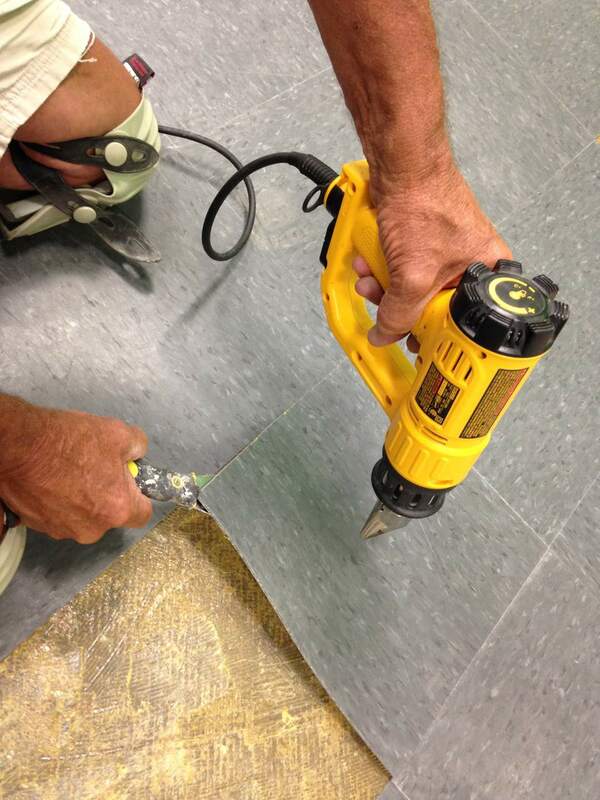 Heat Gun: A heat gun is a relatively inexpensive asset to your tool box. Not only does it aid in flooring removal, it will help with other projects around the house. Because baseboards typically cover the edges of flooring, the baseboards must be removed before removing the flooring. Place the wood block a few inches above the baseboard. Put the flatter end of the prybar on top, where the trim and wall meet. A swift rap with a gloved hand should be enough to force the bar under the trim. If not, rap the prybar with a rubber mallet or hammer. Gently pry the trim away in stages. Yanking back quickly may break the trim. Even if you do not intend to re-use the trim, it's still easier to pull off trim in entire lengths rather than in small, broken pieces. Baseboards often get damaged during removal. So, unless you are removing quality, expensive baseboards, you may want to price out the cost of new baseboards against the work of saving and repairing your current baseboards. If you plan to reuse the trim, devise a marking system on the back of the trim for easier installation later. You may want to begin by writing "1" on the back of the first piece with an "up" arrow, then continuing in this method in an orderly, clockwise fashion around the room. Often, you will find that the vinyl flooring is entirely perimeter-installed, which makes this project go much faster. In other words, the middle of the flooring isn't glued down, just a 6-inch perimeter. Cut about 8 inches away from the walls, keeping your cut parallel to the walls. Keep your utility knife always at hand and slice the flooring off in long, narrow strips, maintaining a width of no more than 18 inches. You can cut off the length only when it gets unwieldy and in your way. Keeping the strips narrow will benefit you later when you dispose of it. It can be tempting to start pulling back or rolling up large sheets at a time. This isn't recommended, as the sheet vinyl can become heavy and difficult to manage. You might start to feel that the flooring is glued down when actually you're fighting the weight of the floor itself. There is no reason to try to keep the vinyl in large sheets unless you plan on giving it to a friend or re-using it in another part of the house. With the unglued middle section removed, it's time to deal with the glued-down perimeter. Hard scraping and tenacity are the best way to go about this. First, begin with the flat end of the prybar. Because the prybar is blunt, it will work only if the vinyl is lightly glued down. When you can no longer scrape with the prybar, switch to a sharper tool. With a freshly sharpened 5-In-1 tool, force the sharp end between the sheet vinyl and subfloor in jabbing strokes. You'll find that the tool chips away the adhesive. With your other hand, keep peeling back the sheet vinyl. When it gets too long (about a foot or so), cut it off with a utility knife to make it easier for you to work. As you start pulling off the sheet vinyl, it may seem deceptively easy. You might actually be de-laminating the sheet vinyl rather than removing all of the flooring. Make sure that you are removing all of the flooring, from top to bottom. Whenever you can get a grip on a section, try to pull it back either perpendicular to the floor or farther back. This gives you greater pulling power. Turn the heat gun on low, wait for it to sufficiently heat up, and wave it around the junction between the flooring and the subfloor. Or, try to heat up the top side of the flooring in a small section, then pull that section back. Your scored strips of sheet vinyl can be folded up accordion-style into squares small enough to fit into the garbage can. The first score will be easy to fold back because you are going with the score. But the second score and all alternating scores are more difficult. You'll need to force them a bit to snap them into a fold. In most communities, sheet vinyl flooring cannot be recycled, so unfortunately you will have to land-fill it. One alternative is to recycle the flooring in-house. For example, if your woodshed only has an OSB wood floor, laying down a sheet of vinyl makes it easier to sweep and will protect against moisture and oil drips.